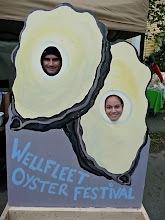 There may be an abundance of lobsters in New England this summer, but nothing like this. 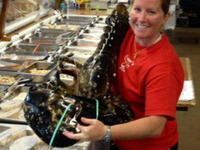 WBZ first reported this week that a 21-pound lobster was caught off the shore of Nauset Beach in Orleans. The lobster is currently on display at Capt'n Elmers in Orleans, where manager Elise Costa told WBZ that the lobster's claws are measured at about a foot long. "Usually, for every four and a half pounds of live lobster, once you cook it and clean it, you get one pound of meat. So 21 divided by four and a half, that would give you about five pounds of meat," Costa said. Don't go rushing to the Cape just yet though for any weekend bake plans. Costa plans to display the lobster for a period of time before selling it or raffling it off for charity. Outdoor Life Magazine posted the photo of the lobster on its Facebook page Wednesday night and got people wondering just how old a 21-pound lobster might be, with a few commenters opining that it might be some 147 years old. The largest lobster on record was a 44-pounder caught in Nova Scotia.